Recently I read an article about working with sensory UNDER or OVER reactive children. I found it very interesting and helpful, I though you might to. 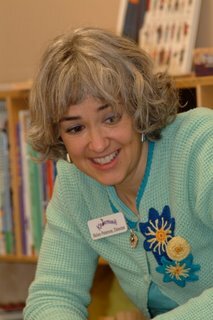 Dr. Stanley I Greenspan is co-author of THE IRREDUCIBLE NEEDS OF CHILDREN. He says it is first most important that we appreciate how each child's sensory system is working. We comfortably notice and label children who are over reactive to stimuli as "sensitive" - Some children find loud or high frequency sounds upsetting. In the Kindermusik environment we see this most often with jingle bells, glockenspiels or triangles. Levels of bright light can seem harsh for some while sudden movements in space such as swinging can be uncomfortable for sensitive children. We DON'T often notice the opposite tendencies. Instead of over reactive some children are UNDER REACTIVE. Sensations don't register strongly so the children seek them out. Kids who are under reactive to touch may want to bang into things or other people, a child who is under reactive to sound will seek it out by creating loud noises. Understanding that all sensory pathways can be either relatively sensitive or insentitive can adjust how we approach each child's behavior. Every child deserves to be understood, not judged in realtion to their individual sensory pathyways. Dr. Greenspan notes, "far too often I see children who have been misdiagnosed as having severe problems, when the individual differences in their sensory systems have just gone unrecognized. 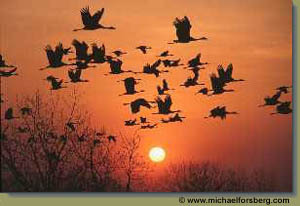 We have returned from the Great Platte River having experienced several days of awe inspiring nature. There is nothing like a few days at the river to heighten my senses, clear my mind and fill my soul with thanksgiving. Interesting, although 18" of snow fell around Overton Nebraska last week, the cranes stayed, following their centuries old patterns of rest and feeding no matter the weather. We could even see them much better because of the snow, a hidden blessing. I have found a few sound clips of the Sand Hills, take a listen. 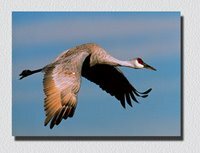 Once again, if I could just attach a sound here it would be the song of the Sand Hill Crane, it is gentle and earie, a cooing song of a taradactyl type dove. We hear it a long while before we see the birds - they fly high, high, high - so many in a flock, they look like a wisp of smoke or a small dark cloud drifting by. My blog will be quiet for a few days. No interent connection in Overton, at least not where I will be, out by the river watching the cranes fly by. Oh, I just can't wait to learn how to put music to this blog. Then I could play the song which shares the title of this post. The learning curve seems steep on that one. The reason to talk of summer already - even though the green grass still lay many inches below our latest snowfall - it surely is time to look into Kindermusik camp for this summer. I have lots of fun new things in the works for the WHOLE month of June. Chose from 3 different weeks and locations. If you haven't tried a Kindermusik Adventures camp before do it this year. It is unique, new, musical, crafty, creative, story telling, sing songy. It will give your whole family something to play with ALL summer. Today I am posting two pictures of my son Tucker. Partly because he has been sick ALL this week and so has been on my mind and heart more than usual. Also because this is a space for you to get to know me better and my kids are a big big part of me. I entitled this post Spring Break thinking of last year when we spent part of March in Mexico. We took a wonderful side trip to an archiological find in KOBA. There is this huge monument to the sun there. It was also like a tropical jungle - about 100 degrees and humid. I am embarrassed to say when we came to the monument I was too hot and tired to climb it - (I also have a little fear of heights . 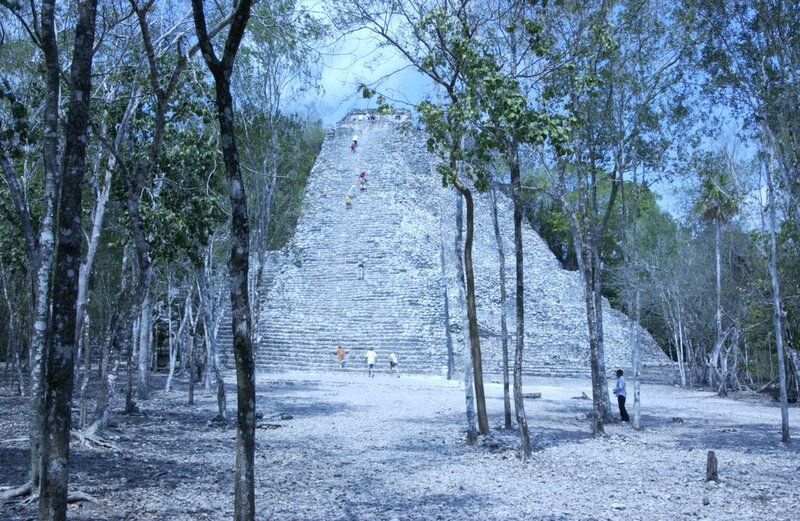 . .) but Tucker scampered right up to the top, looked around and came down. I asked him if the view was amazing - he said it was pretty good but it wasn't about the view it was about personal accomplishment. Wow! Once in awhile your kids really let you know what they are about. The other picture of Tucker is another little spring break trip. Ice fishing on Red Lake. I just wanted to show a sense of contrast in our lives. 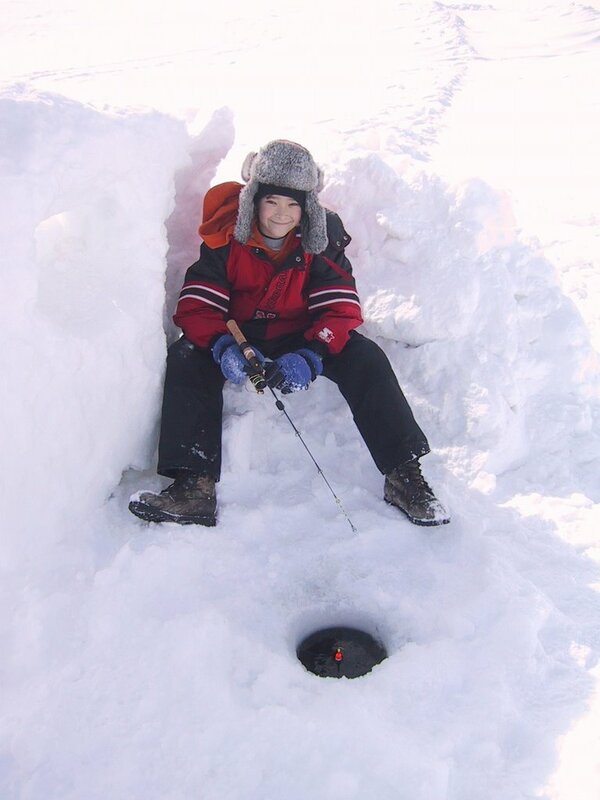 Now I like ice fishing as much as the next girl, but my boys (Trygve and Tucker - they LOVE it!) They spend as many days and nights out on the ice as they can. Many of you have met Tucker because he helps out each year with our Kindermusik summer camps. I hoped you like the pictures and getting to know our Tucker a little better. Take a look at the sweetest video you have ever seen - except ones with your darlings of course. Just imagine you, and them, in a class like this. I think some Sunday nights like this - wow! Here comes another Monday, am I ready? Do I like it like this? Should I re think my schedule for next year? Maybe. I mean it is always good to be evaluating and re evaluating how we are spending our time. But/And - I LOVE my Mondays! How could I not, starting my day with nine 3 year olds (see this class in the picture below) who always have stories just spilling out of them, excited to dive in - sing, play, pretend, talk . . . and can you believe, my day usually gets BETTER from there! What I do for a living just amazing, really amazing! If any one I know is feeling blue or a little low energy, come spend a Monday with me. There is nothing like being in the presence of pure hearts and open minds such as these. Jack in the box Jumps Up! 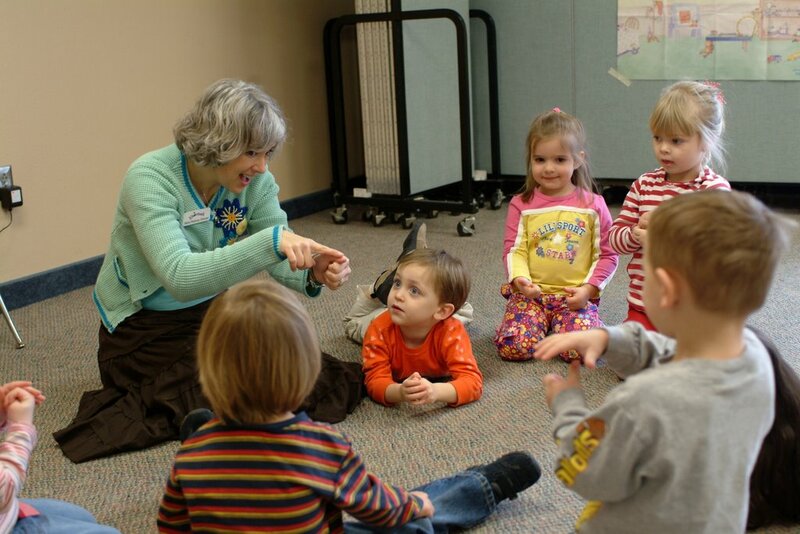 This is a picture of an adorable IMAGINE THAT class that meets at 9:30 on Monday mornings. Here we are pretending that our hands are toy Jack in the boxes. Just now the top on the box is down and Jack - which is our thumb is waiting to pop out. Look at how everyone is moving their fingers - paying attention to the story and trying hard to wait to "jump up!" I especially like the look on Leif's face. He is the little boy to my left - he just loves this song! Toora Loora Loora that's an Irish Lullaby. Although not a drop of Irish blood flows in my veins, I love this day. There has always been something so cheerful mischeiveous and magical about it. What with Leprachauns upending chairs and leaving treats in preschool, (which I have heard tell this week) to green beer and corn beef dinners. Thanks to St. Patrick for this special day. When breathing is shallow, lifting only the rib cage, the oxygen supply to the brain is limited. When one breathes intentionally deeply there is abundant oxygen for higher brain functions. No wonder I was struggling and working so hard, I was giving my brain little to NO oxygen! Here are some other benefits of deep breathing: Relaxation of the central nervous system, imporved inflection and expression, heightened energy level and an improved attention span. Keep breathing, it makes thinking so much easier. It is funny trying something REALLY new. Considering all the expereinces we have had, when is the last time you have expereinced something truely NEW? (Did you know a 3 year old child learns about 9 new words every single day - that is remarkable, I can't remember my last NEW word). Well, this is it for me. Every key stroke, post, preview, publish, edit, unpublish - it is a big surprise! It has worked sometimes. I have written some things that are no longer viewable - hmmm, I wonder where they have gone. I think the picture is too big, and probably not the right one - my name isn't right either. But I am having some fun with this and have decided to carve out some time to keep learning about it - and I wouldn't mind a new word here and there either. 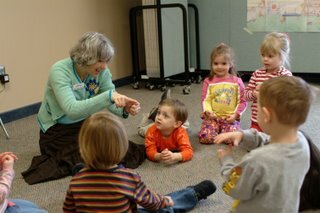 Here I am teaching a Young Child Level 4 Kindermusik class. Behind me you can see a book called Children Just Like Me - which I recommend for ALL families. It shows children from all over the world, their toys, favorite things to eat, their pets, schools, places of worship, and interesting facts about their lives. There is so much I love about music. One big thing is what an amazing connector it is for everyone of us who is spinning on this world. HI! I am stepping out into the world of technology. It is new for me, luckily my daughter, Lorelei, is here by my side helping me to get started. Really what I am about is communication, and I don't want to miss the chance to talk to you in any way I can. If you are reading this, it is most likely because you know me and know what I do, which is, sharing music with children and their families. No one is as lucky as me when it comes to "job satisfaction"
Currently, I am stretching in a new way, by writing and teaching a new kind of curriculum for families - the classes are busier, and bigger, as is my joy at seeing it all unfold. Oh, one more thing for today. I am DELIGHTED with the beautiful snowfall!! It is what I have been waiting for all winter. Enjoy, enjoy, enjoy it - it won't last long, it is almost St. Patricks Day afterall. Peace.